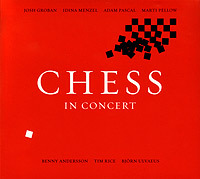 This convoluted tale set during the Cold War and world chess tournaments (crossing over from the '70s to the '80s) was written by the celebrated Tim Rice with music by the Abba boys (Benny & Bjorn), and spawned a couple of hit singles. But the Broadway show was an apparent admitted disaster. Across the decades many versions of the show has seen the light around the globe (including a South African version). The quality of the songs however has kept the interest there and a new rendition was resurrected with the fantastic voices of Josh Groban, Idina Menzel, Adam Pascal and Marti Pellow attached. Recorded at the Royal Albert Hall with the London Philharmonic Orchestra, this breathes new life into the show that could've been more than it became.